I mentioned S. John Ross‘ list of personal GURPS book ratings in an aside to my love letter to Warehouse 23 and Illuminati, but after using it to track down a bevy of awesome-looking books the other day, I realized it needed its own call-out post. This list is a fantastic tool (and trouble for my wallet). 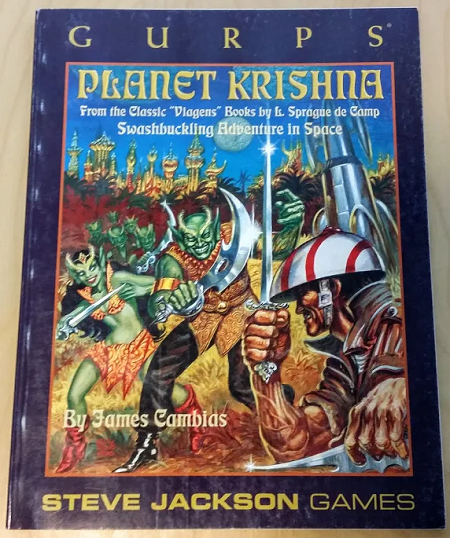 My latest $5 GURPS acquisition, which I snagged based on its placement on S. John’s list, was Planet Krishna, by James Cambias. This is a book I’d ignored when browsing in-stock GURPS books in various places, and I would have continued to overlook it had it not appeared in S. John’s list — and that’s what I love about the list! He’s also done a version of the list sorted by rating, with only books he rates 75% or higher appearing thereon, and this version is the one that’s cost me some money. One of the only books to score a 90% on the list is GURPS Time Travel, which I can’t stop writing about because it’s so damned good. Warehouse 23, another personal favorite, clocks in at 85%. In fact, every GURPS book I’ve ever liked appears somewhere on the best-of version of the list. Based on loving S. John’s work, and after my first couple forays into his recommended books bore fruit, I see a lot of overlap in what we look for in a GURPS book. Which is why I’ve been trawling the list and then visiting my favorite haunts to track down the ones that catch my interest, generally for under $10 a book — and sometimes for as little as $4. So yes, S. John’s list is trouble . . . but it’s the best sort of trouble. It’s mystifying to me why old GURPS books are so cheap, but I’m not complaining. They’re fantastic resources for any game, and they often include bibliographies which, in turn, inspire more great reading.